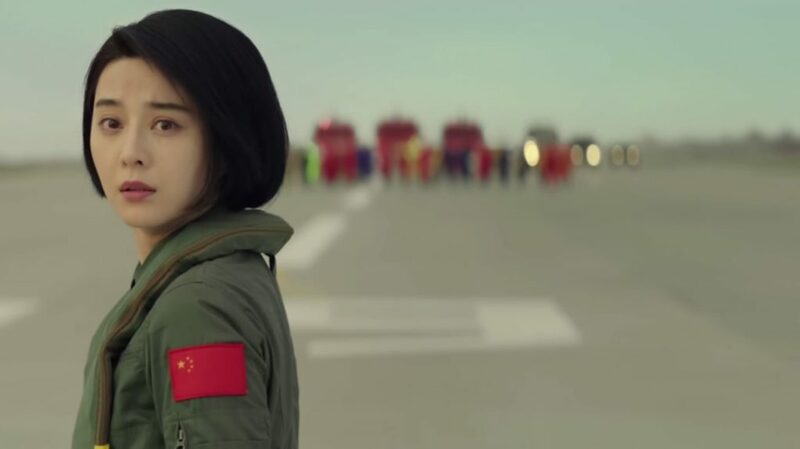 "Sky Hunter" showcases shiny Chinese fighter jets, global ambitions, and...Fan Bingbing. After Wolf Warrior 2’s resounding box office success, I felt super pumped to watch China’s latest military action flick Sky Hunter — especially since it stars Fan Bingbing (China’s most popular actress) as a helicopter pilot. While a plethora of films have featured the People’s Liberation Army’s ground forces, movies showing off China’s latest fighter jets are harder to find. Despite the Chinese media’s claims, there’s only been one other Chinese air combat movie: 2011’s Lock Destination (歼十出击). Even if Sky Hunter might not be the first of its rare kind, it’s certainly the most modern. Unsurprisingly for a Chinese propaganda film, Sky Hunter‘s opening sequence involves the People’s Liberation Army Air Force (“PLAAF” from hereon out, to avoid the mouthful) intercepting a US Navy P-3 Orion surveillance flight, presumably in the South China Sea (though only “Eastern China” is mentioned). Hm… remind you of anything, perhaps near Hainan Island? Anyways, ace pilot Wu Di (lit. “no worthy enemy”, played by Li Chen… who happens to be Fan Bingbing’s fiance) and his wingman engage the P-3 in theatrical flight maneuvers using their J-11s. Rather than flipping off the American naval aviator a la Top Gun, Wu Di inverts his aircraft in order to wave a Chinese flag. After some tense missile lock-ons from escorting F-15s and plenty of flare deployments, the stand-off concludes with both countries’ planes returning home. We’re subsequently shown a scene where Ya Li (Fan Bingbing) pilots a Z-8 helicopter on a civilian rescue mission. During this mission, she miraculously ascends a rope carrying two civilians — seconds before a flood engulfs the school they’re in. This film is an absolute treat for any fan of military hardware. From showcasing bleeding-edge Chinese aircraft (J-20, anyone?) to exhibiting the latest Chinese small arms, Sky Hunter benefits greatly from Chinese military sponsorship. Needless to say, it got special access to equipment rarely (if ever) seen in Western films. Sky Hunter continues Wolf Warrior 2‘s trend of demonstrating China’s benevolent intervention in foreign affairs — especially when rebel groups threaten a stable (friendly) government. In Sky Hunter, the presumably former-Soviet state of Mahbu falls under threat when a group of rebels seize a military airfield, leaving the incompetent local military unable to respond (interestingly, their generals all have British accents). A crack group of pilots including Wu Di and Ya Li are sent to assist a daring special-forces rescue of Chinese nationals held hostage on the airfield. We later find out that they were also defending Chinese economic interests — evidently China was building a high speed rail through the country as part of its One Belt, One Road initiative. Critics at the South China Morning Post bemoan the film’s excessive use of CGI, while the Straits Times argues that Sky Hunter is nothing more than a “thinly disguised showcase of China’s military might in the skies”. Both are right: Top Gun was shot with live US Navy aircraft after all, and it’s true that Fan Bingbing took a backseat to the PLAAF’s might throughout the film. That said, CGI technology has come a long way since the days of Top Gun, to the point where it’s barely noticeable that the dogfights are not shot with real planes. Do I wish Fan Bingbing’s role had more depth? Certainly — it’s disappointing to see one of China’s most famous actresses reduced to a mere flat-character love interest who seems to do nothing more than reject the ace lead’s advances or cry for his safe return. For all its flaws, Sky Hunter is a decent action flick without any ridiculous plot elements (unlike the first iteration of Wolf Warriors). Certainly, it shows that the Chinese government is getting better at shooting patriotic movies. Sky Hunter (Chinese: 空天猎)–Directed by Li Chen. First released September 2017. Running time 1 hour 55 minutes. Starring Li Chen and Fan Bingbing. Do you like Chinese war movies? Check out Cinema Escapist’s list of the 5 Best Chinese War Movies through 2017!